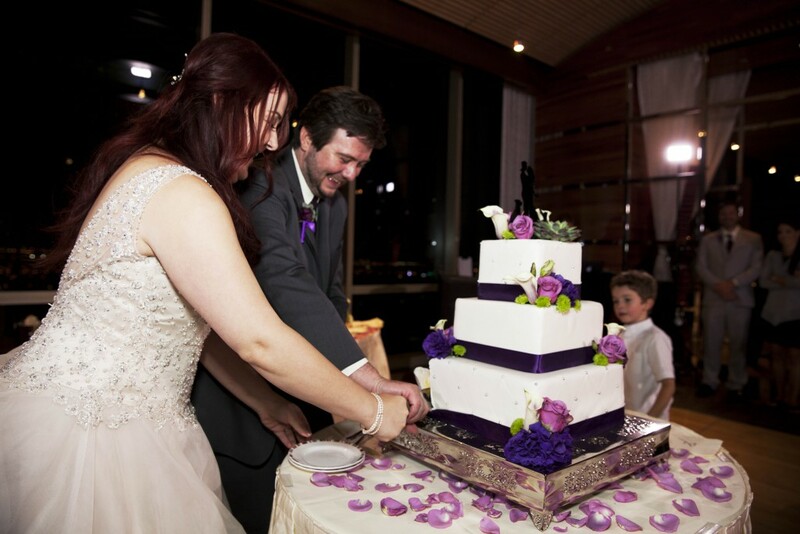 We are so honored Jennifer and Timothy asked Weddings By Dzign to plan their Las Vegas destination wedding. With families in both Utah and Colorado, the couple thought Vegas would be the perfect destination for their loved ones to come together for a four-day weekend celebration—and we couldn’t agree more. 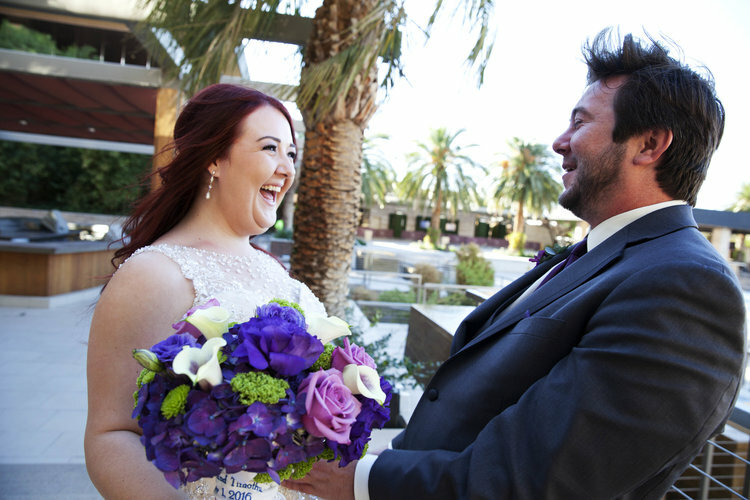 The couple knew from the get-go they wanted their Las Vegas destination wedding to be one that was elegant and romantic, but that also offered up lots of fun and celebratory moments for their guests. 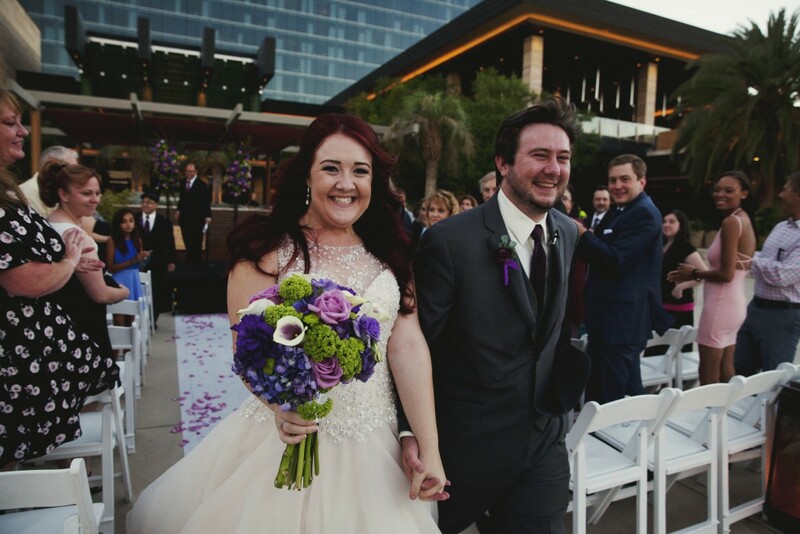 They chose a purple color palette with various shades of green as accent hues throughout, which ended up being a great choice for an autumn wedding in Las Vegas. 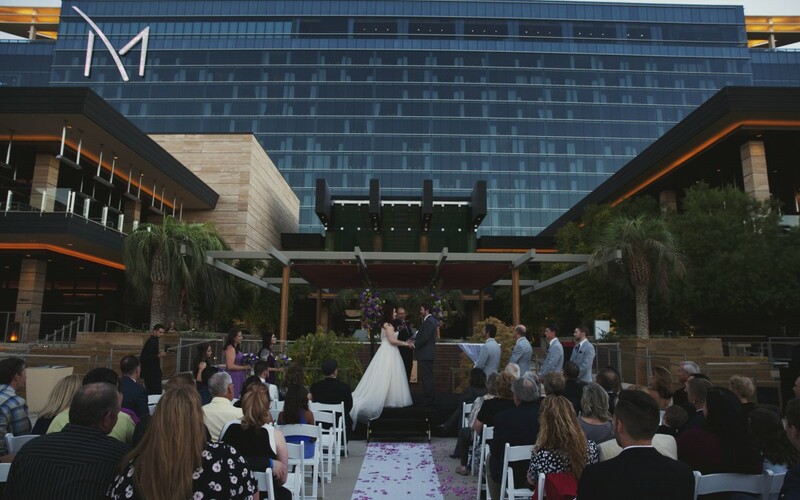 Jennifer and Timothy chose to marry at the M Resort, which provided a great celebratory space for their friends and family to come together. 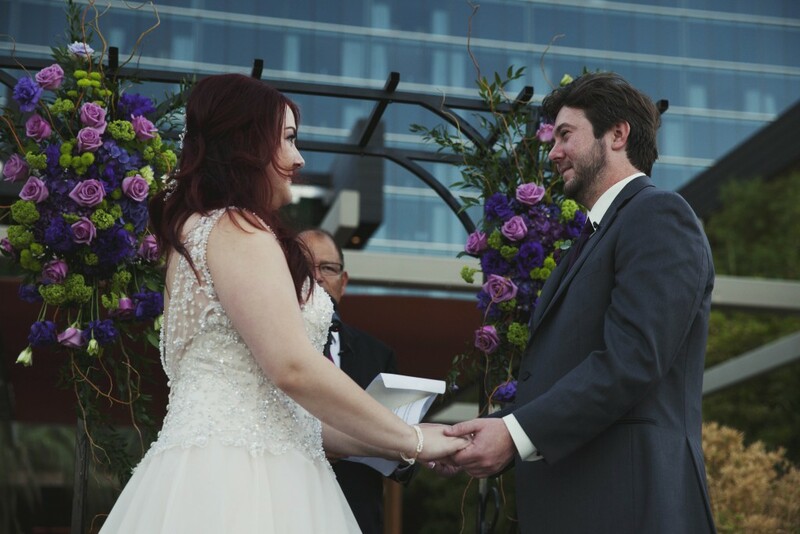 The ceremony took place outdoors, and we brought in a black arbor, which Floral By Dzign dressed up with cascading arrangements of green and purple florals accented with curly willow branches. The contrast of the bright purples and greens against the stark black arbor made for some stunning shots. 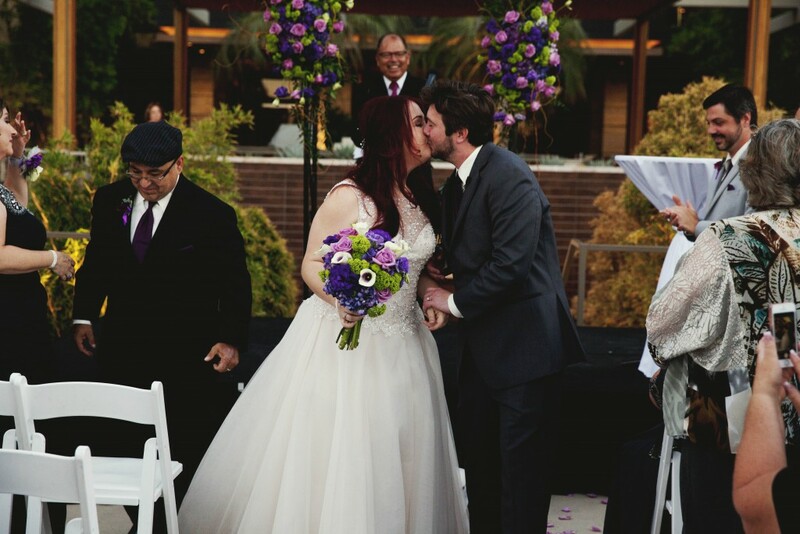 We also dressed the aisle in lavender rose petals and, when all was said and done, the lavender accents mixed with willow branches felt so whimsical and romantic—and made for a beautiful backdrop for the couple’s sweet ceremony. 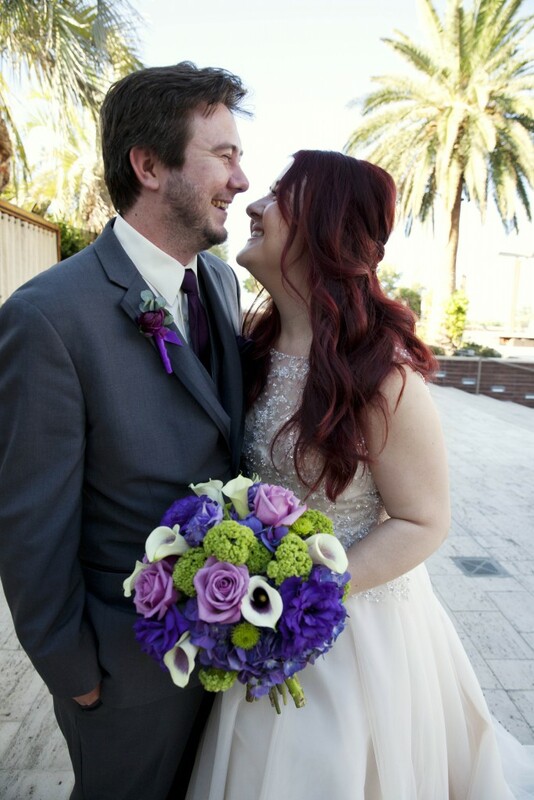 Jennifer wore a stunning beaded-top gown, and her bouquet consisted of Picasso calla lilies, lavender roses, purple hydrangea, purple lisianthus, green button mums and green viburnum. 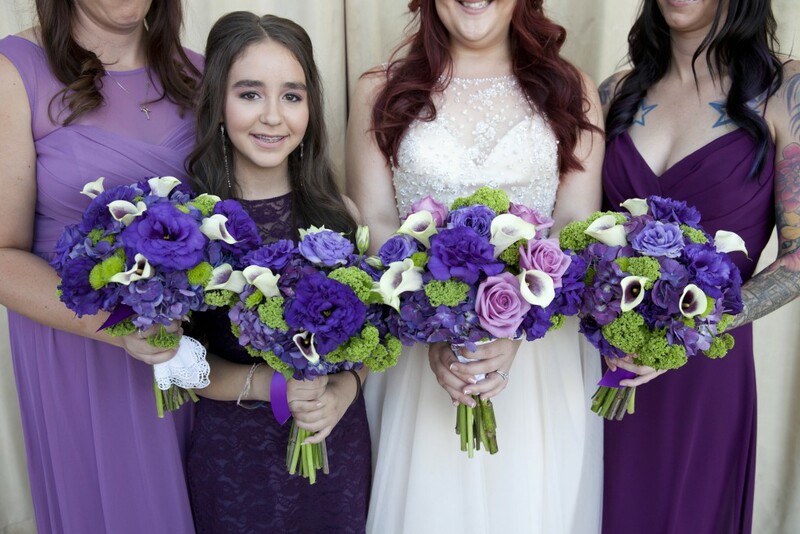 Bridesmaids wore varying shades of purple and held bouquets of Picasso calla lilies, purple hydrangea, purple lisianthus, green button mums and green viburnum, tied off with simple purple ribbon. After the ceremony, guests continued the party indoors where the couple cut a clean-lined caked dressed in lavender roses, purple lisianthus, green button mums and Picasso calla lilies—set on a table adorned in dreamy lavender rose petals. The couple ended up honeymooning in Paris and Barcelona (we’d be lying if we said we weren’t jealous)—continuing on with their wedding theme of drop-dead gorgeous romance. Overall, this was such a beautiful event celebrating an even more beautiful couple, and we were beyond thrilled to be a part of it.